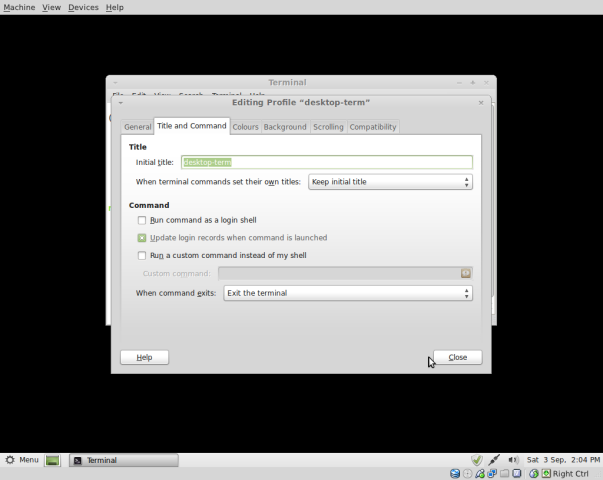 By the end of this tutorial, you will have a terminal window embedded into your desktop. Which is precisely as cool as you think it is! You can click on any of the images in this tutorial to get a better look. You have a reasonably well specified computer running Compiz and an inner geek just begging to get out. 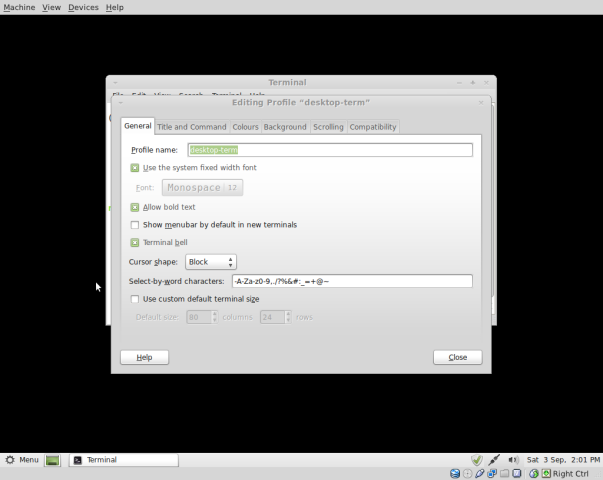 Open a terminal window and click on Edit -> Profile. Then click the New button. Call your profile desktop-term and click Create. In the General tab untick "Show menubar by default"
In the Title and command tab set the Ititial title to your profile name and change the dropdown to Keep initial title. In the scrolling tab, set the scrollbar to Disabled. Click close until you are back at the terminal and then you can close down the terminal. Change the sleep time to whatever works best for your system and you can copy and paste the gnome terminal command form your run box with the values that work for you. Finally under the control centre go to startup applications and add a new item. Give it a meaningful title and the command /home/YOUR-USER-NAME/path/to/desktop-term.sh and click close. Anything that makes the terminal more pervasive and ubiquitous makes the world a prettier place. Also, every time a terminal opens, a penguin gets it's wings. kazztan0325	 How nice this tutorial is! Not only its content is unique, but also its formation is excellent. I think this is a model of tutorial for us. trollboy	 Nope. It's not as cool. It doesn't have that *wow* factor and frankly it's boring. remoulder	 "one "Show desktop" click!" - ok but a panel launcher for terminal surely does the same thing? trollboy	 I like to use the terminal a lot. My other tutorials should show that ;) and having one embedded in my desktop, one "Show desktop" click away is just too cool. And yes. I am a geek. remoulder	 Nice tutorial even though I fail to see what advantages this would have over a terminal window or why anyone would want it in the desktop. Surely if it's in a fixed position one is always going to be covering it with other windows?